Introducing Ann Taylor Winter 2014. Photo courtesy of Ann Taylor. HEADS UP: Here we are, negotiating the early days of summer. What does this signify? Too many things to name. In the rag trade, however, one aspect of the season is the round of press previews of designer and brand fall-winter collections that end some time in August. Team VEVLYN'S PEN has not had much to say of late about fashion. We take this time over the next seven or eight weeks, however, to break our silence to jaw about what select brands and/or designers will have in store (literally) beginning in a matter of a few weeks through the end of the year. Do bear with us, this is our maiden voyage into these waters outside of fashion weeks. Anchors aweigh! CUTE leather jacket in burgundy. Liking on the leather jeggings, or are those leggings? The animal print peacoat has some possibilities. Yours Truly is milling about a cavernous showroom on the 5th floor of the Times Square Tower, considering Ann Taylor Winter 2014. Nothing has knocked my socks off (not that I am wearing any), but a body can always count on the Ann Taylor brand to deliver sense and sensibility. Besides, a body doesn't always want her socks knocked off. 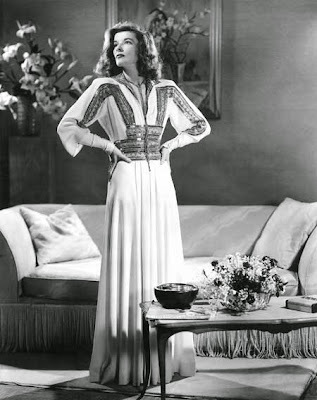 Katharine Hepburn as Tracy Lord in "The Philadelphia Story" or is she an Ann Taylor model? Archive photo. Elsewhere, those black leather shorts don't bare derriere. The faux-jewel encrusted wool tops cause the heretofore roaming eye to hover; ditto for the pink /peach series surrounded by a sea of black&white&cream&gray covering wool, boucle, cableknit, lace, as well as the aforementioned leather. The Ann Taylor maxi dress has few time constraints. Photo courtesy of Ann Taylor. Which brings this mediation around to LA's piece de resistance: A body-skimming (not hugging) black maxi dress with three-quarter inch sleeves and a semi-circular collar and cut-out at neck. Down the front, an abbreviated split. Accessorized with belt and bracelets. In short, sublime simplicity. Immediately, this mind goes to Katharine Hepburn in “The Philadelphia Story” and Rosalind Russell in “Auntie Mame. Here is a silhouette that never goes out of fashion. Visit http://www.anntaylor.com/ in another month or so to learn more about the Winter 2014 collection; similarly, visit a brick and mortar store near you.